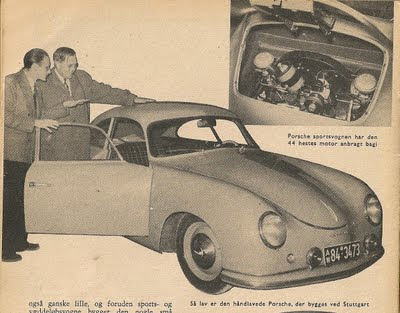 The Sechs volt Garage Blog: The new 1952 Porsche! While visiting Stuttgart, Clymer was presented to the lovely Pre-A 356 Porsche. "...the sportscar is supplied with a rebuilt vw-engine, with two carburettors and a high compression top end. The production rate is 100 cars a month, and they are almost completely hand built by 150 workers. The price is 10.500 DM for the coupé, and 12.500 DM for the cabriolet. The sportscar comes with three options enginewise, 1100ccm, 1300ccm and 1500ccm. With the biggest engine, the car can go 160 km/h, which is quite impressive for a car with a engine that small...."
Great pic guys, the engine might be ´52, but the car is a ´50. Just thought I should mention it:). Very interesting details in the photo.